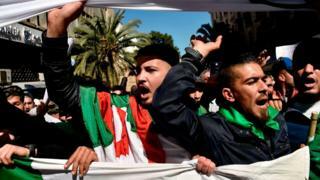 Weeks of protests in Algeria have pushed long-time leader Abdelaziz Bouteflika to drop his plans of running for a fifth term as president. However, he remains in office and protests have continued, with calls for him to resign immediately. The BBC's Ahmed Rouaba looks at what might happens next in the country. The significance of Mr Bouteflika's resignation cannot be understated. He has been in power since 1999, so almost half of the country's young population have only known him as president. So is this a defeat for the regime? There is no doubt that this is the end of Mr Bouteflika. A senior party figure in the ruling party, Hocine Kheldoun, said in a TV interview on Thursday that the long-serving leader was "history now". But many Algerians believe that the octogenarian's health has declined to such an extent that he is just being used as a front by the murky group of businessmen, politicians and military officials, known as "le pouvoir" (the power) who don't want to give up their influence. So the protesters see the concessions as a ruse to avoid far-reaching reform. The new Prime Minister Nouredine Bedoui, a close ally of Mr Bouteflika, has been tasked with bringing about political reforms until new presidential elections are held. His government is also expected to organise a national conference, but no dates have been given for either the elections or the conference. And for the moment, Mr Bouteflika remains in office. One of the protesters' new slogans is: "We wanted elections without Bouteflika, we were given Bouteflika without elections." Is Bouteflika still in charge? His supporters say the 82-year-old leader is "mentally and intellectually" capable of running the country. How does reclusive President Bouteflika run Algeria? However, since suffering a stroke in 2013 he has rarely been seen in public and does not travel around the country or abroad, except for medical treatment. His aides represent him at events and read his messages to the public. He was not physically present at the constitutional council to submit his paperwork run for his fifth term as required by the law. And the announcement that he was not standing was read on his behalf by a newsreader on national TV. Some say his brother Saeed is making key decisions for him, although the reality is much more complicated. Saeed is at the head of one of the groups which make up "le pouvoir". Why is it so hard to find another candidate? A veteran of Algeria's war of independence, Mr Bouteflika's upper-class, Westernised style led him to be called "the dandy diplomat" in some quarters. He came into office, backed by the army, after the 1990s civil war and was largely viewed as a unifier of the many factions underpinning Algerian politics. Unlike some leaders in the region, his presidency survived the protests of the Arab Spring in 2011 - until now. Mr Bouteflika has been the pivot, or the balance, in the patronage created by "le pouvoir" - a system of rule which gives power to a small privileged group. He has been key to making this complicated and conflicted system work. It is unclear what would happen in the country if the cog for the past 20 years is removed. And this is why it has been so hard to find an alternative. So why did the government back down? One thing that is clear is that the government was taken by surprise by the sheer number of protesters that have been pouring onto the streets for weeks and also their unrelenting push to achieve their goals. It seems that the government had underestimated how unpopular it had become after years of corrupt and repressive rule. The protests, which were initially led by young people, were later joined by lawyers, judges and teachers, making it an intergenerational push for change. Some parents have also taken their young children to the marches. Public broadcasters which had ignored the demonstrations in the beginning were later allowed to cover them. The demonstrators have also been largely peaceful, and adhered to a code of conduct which has been widely shared on social media, to reduce confrontation with security forces. In fact, the peaceful nature of the protests earned praise from former Prime Minister Ahmed Ouyahia, who resigned this week after President Bouteflika dropped his fifth-term plans. The security services have also showed an unusual self-restraint towards protesters which could suggest that they are not prepared to use force against them. The government, and all Algerians, are also aware than any violent clashes are likely to escalate and get out of hand in a country which was torn apart by a decade-long civil war in the 1990s. It was not hyperbole when Mr Ouyahia warned that "the situation in Syria also started with roses". What does the opposition want? The main opposition parties have rejected the decisions of the government to delay the elections and hold the national conference. A constitutional law expert at the University of Algiers, Fatiha Benabou, told the AFP news agency that there was no legal basis in the Algerian constitution for postponing the elections and that Mr Bouteflika's announcement did not refer to any legislation. The leader of the opposition Adala (Justice and Development) party, Abdallah Djaballah, is currently co-ordinating talks that include the HMS (Society of Peace) party and political personalities, including former prime ministers Ali Benflis and Ahmed Benbitour, as well as prominent human rights lawyer Mustafa Bouchachi. Other political parties are expected to join the group, including the Socialist Forces Front (FFS), a social democratic and secularist political party which has boycotted previous elections because of alleged fraud. Kamel Guemazi and Ali Djeddi, members of the banned Islamic Salvation Front (FIS), were also seen at the opposition talks. The FIS won the first multi-party legislative elections in 1991, which were later cancelled by the military, leading to the civil war. The opposition says the current regime cannot continue to run the country against the will of the people and beyond the scope of the constitution. Adala party MP Ben Khallaf told the BBC the opposition was preparing for its own national conference to set up a roadmap for reforms. He added that protests would continue until the will of the people was respected by the regime. There is no indication that opposition political parties have influence on the protests which were led by waves of youths not involved in party politics. Opposition parties - which range from socialists to Islamists - are known to be deeply divided and have failed on several occasions to come together and find common ground to stand up to the regime. However, the alternative national conference proposed by the opposition does present a robust challenge to the government. They, however, have to take into consideration that the people went to the streets to end politics as usual - and this might include the traditional opposition parties. Mustapha Bouchach, a prominent figure in the opposition has refused to speak for the protesters as suggested to him on social media. He said on a local TV programme: "These protests are led by the youths who are in the streets. They speak for themselves and no-one has the right to spoil their successes." He urged the political parties and personalities in opposition to support the protesters and not try to take the lead form them. "That would be a big mistake," he added.